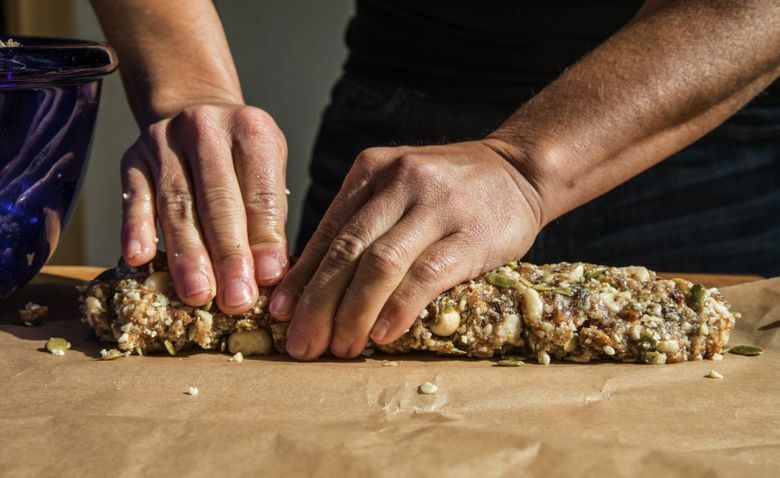 The chef and owner of Tilth and Agrodolce says these Macadamia-Banana Crunch Bars are easy to digest, keep the engine running and taste amazing. 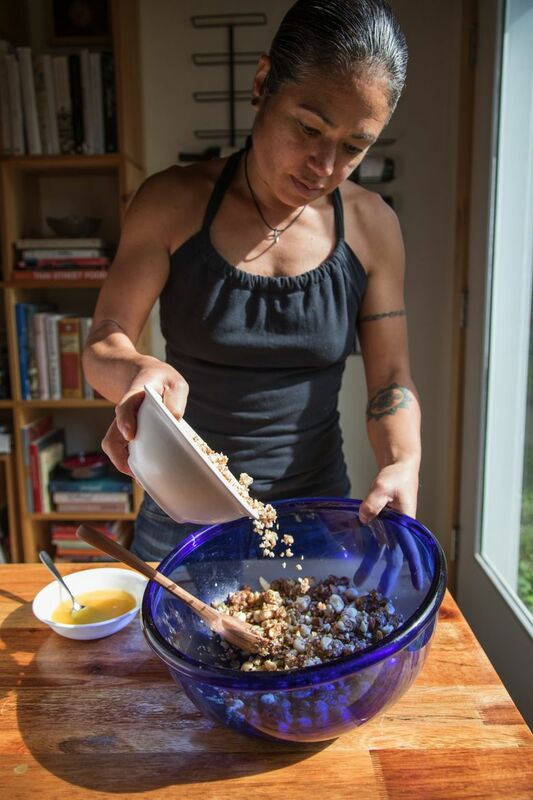 MARIA HINES KNOWS more about making food delicious than you do (unless you also own two certified organic restaurants and have won a James Beard award), but when it comes to her own nutrition, she had to figure it out like the rest of us. Hines is best-known as the chef and owner of Tilth and Agrodolce, but on her own time, she is an avid rock climber and runner. Her interest in nutrition was a natural one. She was curious about how to fuel her body through marathons, hikes or long days of climbing. She wanted to eat food that tasted better than many “healthy” options available — she doesn’t do prepackaged bars. She tested options on herself, experimenting with a ketogenic low-carbohydrate diet and as a vegan. She now adheres to a mostly paleo diet. Paleo-ish, as she says. Hines’ own health issues pushed her to examine the way she ate. Last year, she came down with adrenal fatigue syndrome, due to the stress of running restaurants, she says. She cut out coffee and sugar, and forced herself to rest. She now meditates in her car when transitioning between restaurants. Hines approaches food from the perspective of an endurance athlete, and the best way to fuel before and during a long day of climbing. Like her restaurant menus, Hines prefers to eat locally and with the season, when food is at its peak and has the most nutrients — asparagus in spring, berries in summer, hard squash in the winter. “You can have incredible, luxurious, super-flavorful meals that are super-nutritious, full of fat and full of flavor,” Hines says. She has figured out her body does best with moderate carbohydrates, around 100 to 150 carbs per day. She keeps her carbs on the lower side on less-active days, and eats more on days with intense workouts, especially afterward. She is mostly gluten-free, though she eats whole grains, and she skips most dairy. Hines eats a lot of vegetables, and has to ensure she gets enough protein; she drank a pea protein smoothie during our interview. She stays away from sugar, though she will have natural sugars, like honey or maple sugar. The biggest challenge she faces as an athlete, particularly an outdoor one, is lack of refrigeration. One of her favorite go-tos is to carry a tin of smoked trout, an avocado, fresh lemon juice and Himalayan sea salt. She cuts open her avocado, scores it, puts in lemon juice and sea salt, and alternates with bites of avocado and trout. She also makes a carrot-raisin salad mixed with mayonnaise and peanuts. Other favorite portable fresh foods: hard-boiled eggs; roasted sweet potato; boiled whole potatoes (fingerling, marble and Yukon are favorites) seasoned with salt, pepper, olive oil and paprika that she carries in a zip-lock bag, tucks into a pocket and pulls out while climbing. Hines will eat some bars — the ones she makes. 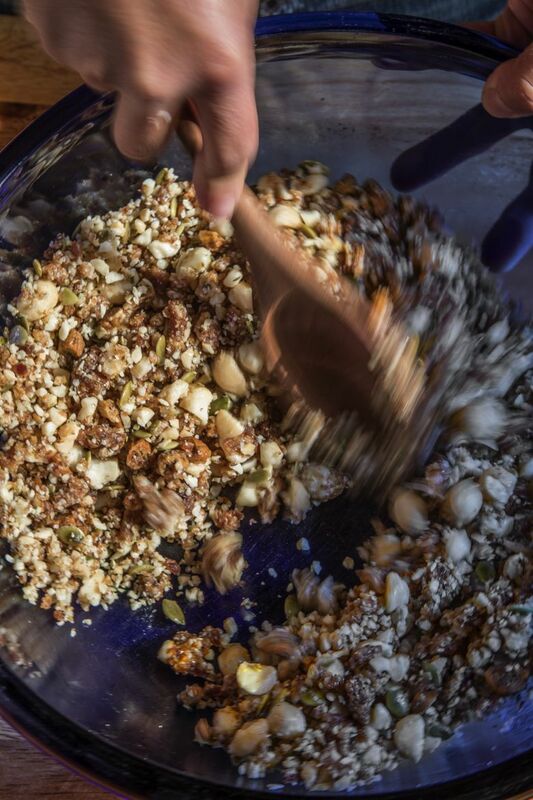 She makes date rolls, mixing dates and nuts, and slices and freezes them in individual bags to grab for active days. “Nutrition and the pleasure of food go hand in hand,” says Hines, who is co-writing a book on nutrition that includes her own recipes. For Hines, the focus on nutrition remains crucial for her mental health and daily energy. Eating well helps her keep her energy even, and allows her to pay attention to how she is feeling, regardless of activity level. “Having mental clarity is more important to me than having physical strength,” she says. 1. Place 1 cup macadamia nuts and 6 dates into a food processor; blend to paste. 2. In a medium-size bowl, blend paste with the rest of the ingredients. Mix thoroughly with a wooden spoon. 3. Place mixture on parchment paper, and roll into a log. Freeze for 20 minutes, and cut into 3-inch mini logs.